Endoca Raw Hemp Oil Drops are a full-spectrum extract with synergistic terpenes. It contains natural constituents of healthy hemp oil. This liquid hemp oil comes in a 10mL bottle and contains 3% CBD (300mg). With a total of 300 drops, each drop contains 1mg CBD. There’s also a 1500mg version available if you’re looking for something even stronger. 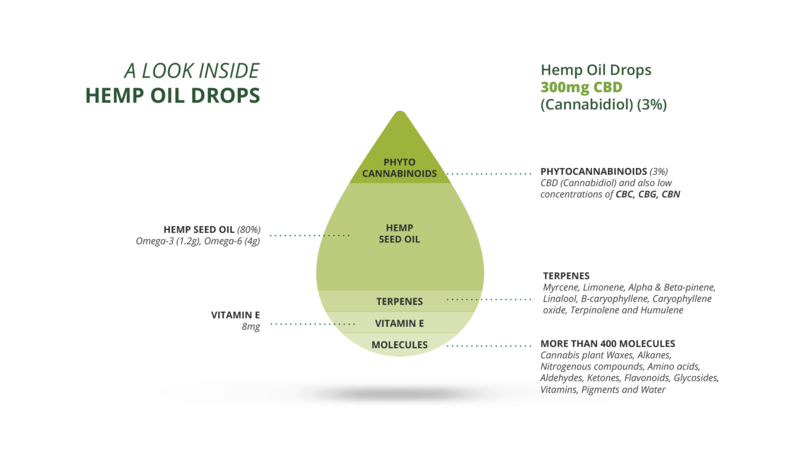 The Raw Hemp Oil Drops are CO2 extracted without the use of heat and contain 15% CDBa+CBD. Unheated and unrefined, this raw hemp oil maintains the full spectrum of cannabinoids, terpenes, and flavonoids from the hemp plant. For taste and consistency, a cold filtration process is used to remove any waxes. Both CBD and CBDa are beneficial and hold similar, if not sometimes identical, properties. It is up to your experimentation and research to figure out what cannabinoids works best for your body. Terpenes: Myrcene, Limonene, Alpha & Beta-pinene, Linalool, B-caryophyllene, Caryophyllene oxide, Terpinolene, and Humulene. Other natural molecules: Cannabis plant waxes, alkanes, nitrogenous compounds, amino acids, aldehydes, ketones, flavonoids, glycosides, vitamins, pigments, water, co-factors, and co-nutrients.